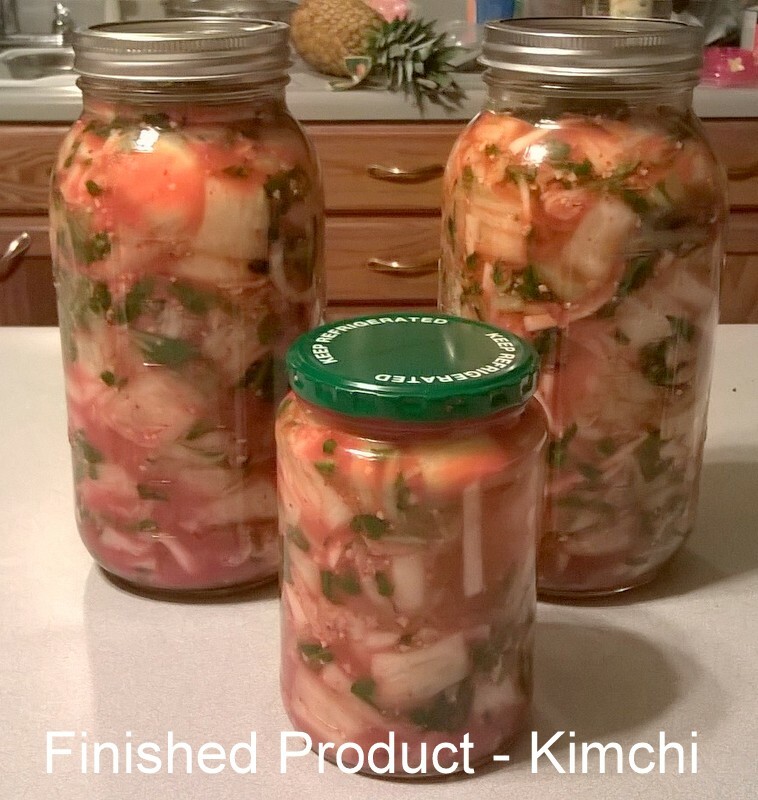 The Time is Now for Kimchi!!! 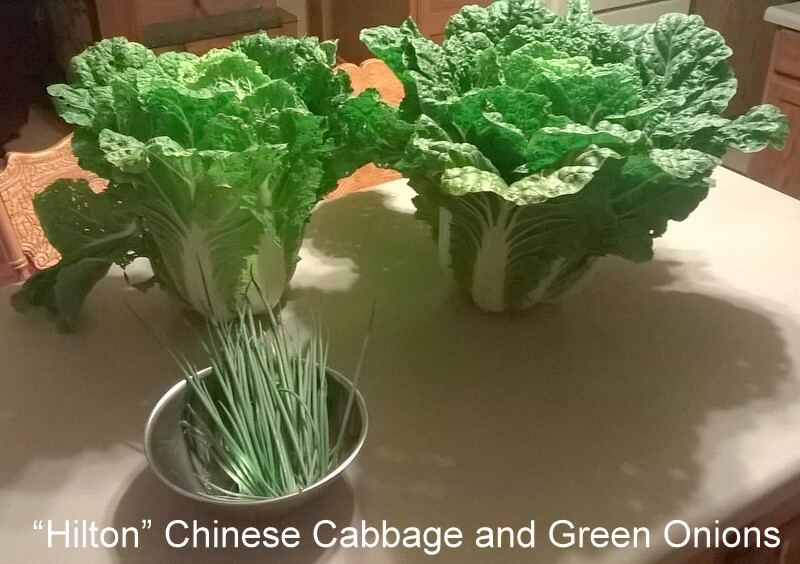 The “Hilton” Chinese Cabbage is in the house! 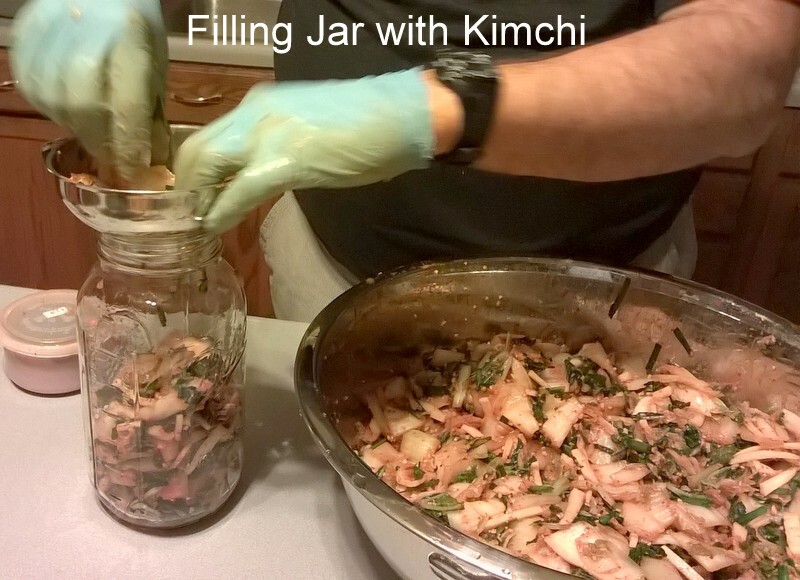 It’s Kimchi time!! The big cabbage is 18 inches wide and 16 inches tall. They are gorgeous! Check out this cross section! 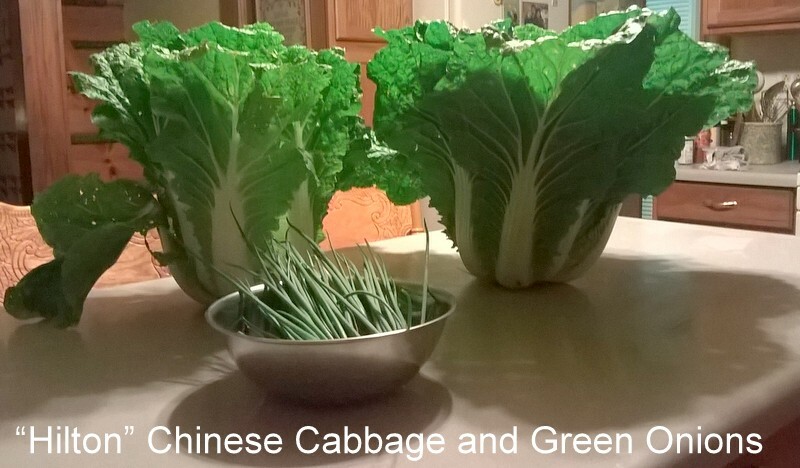 First cut the cabbage width wise in 2 inch strips. 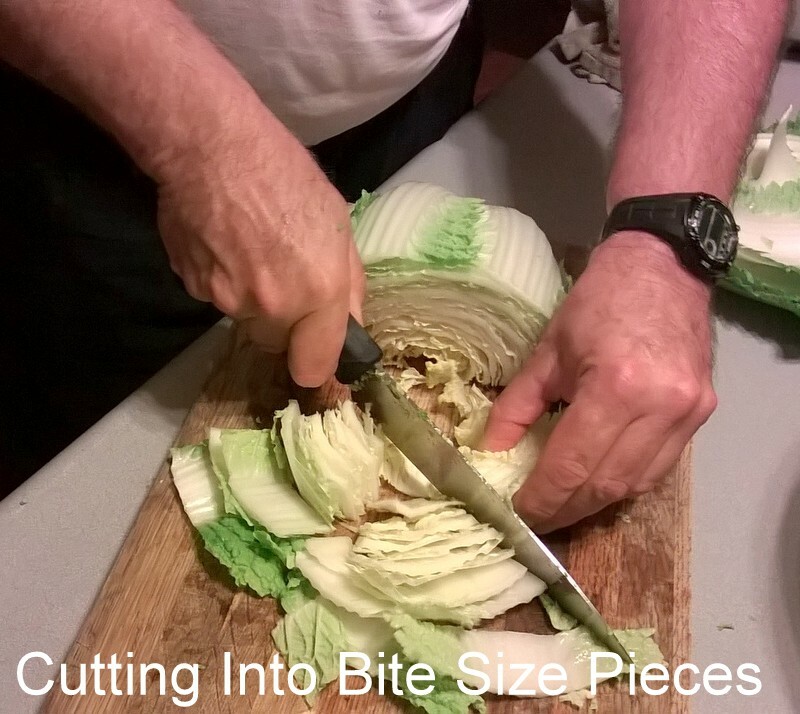 Next, cut the strips into bite size pieces. 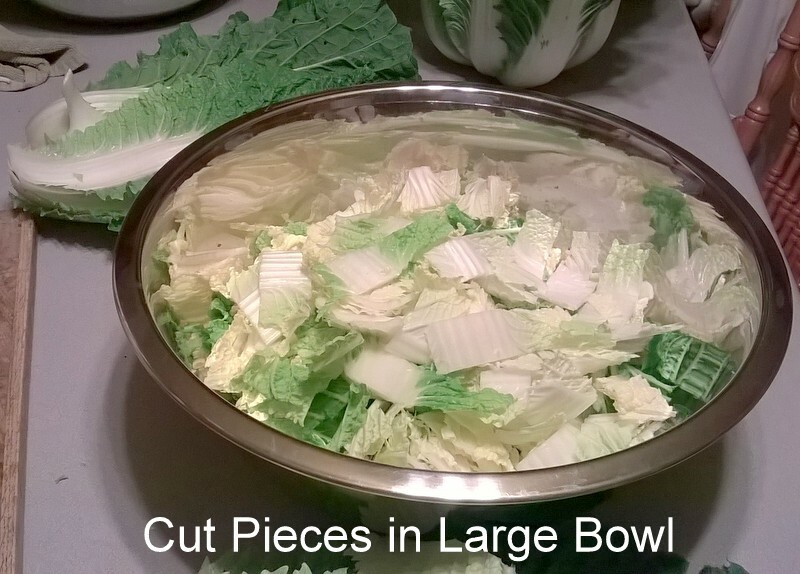 Place bite size pieces in a large, non-corrosive bowl. 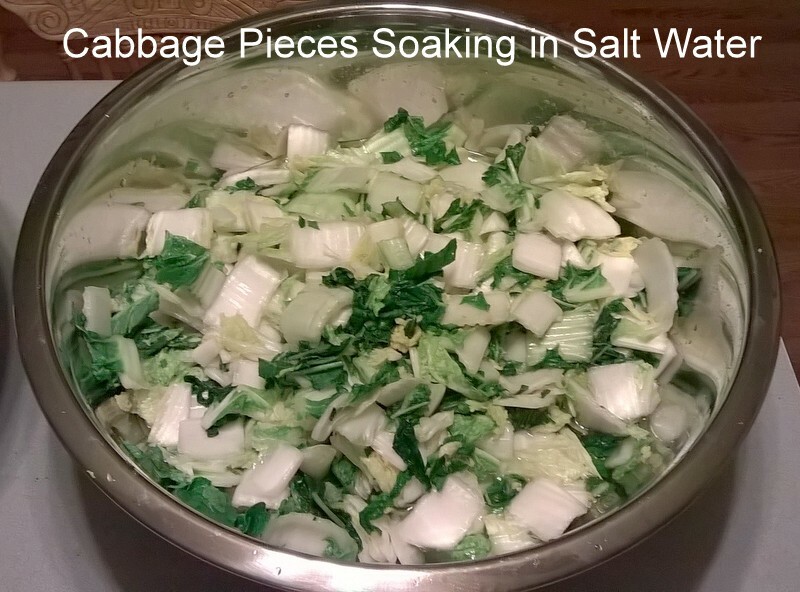 Add Kosher/pickling salt to warm water and pour over the cabbage. This brine wilts the cabbage and starts the fermentation process. The covered bowl sits for 12 hours prior to rinsing with water. 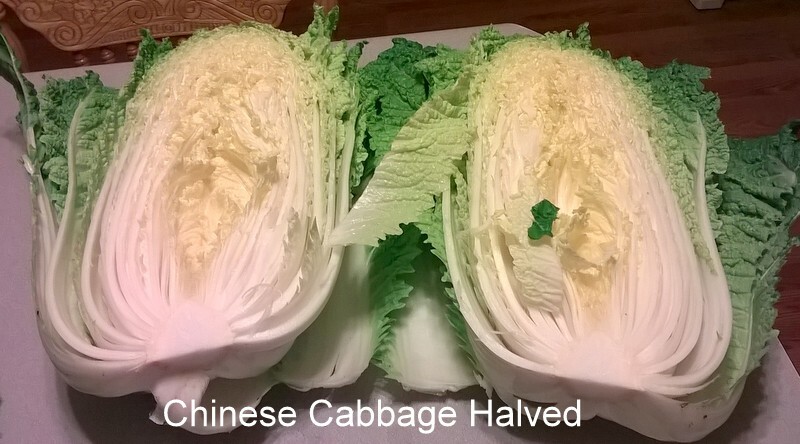 Prior to rinsing the cabbage, it is wise to prepare the additional ingredients. Pare green onions to 1 1/2″ to 2″ lengths and place aside. Mince several tablespoons of garlic and place aside. Mince a few tablespoons of fresh ginger and place aside. Pare Daikon radish into 2″ match stick size pieces and place aside. Combine green onions, garlic, fresh ginger and Daikon radish with the rinsed cabbage in a non-corrosive bowl. 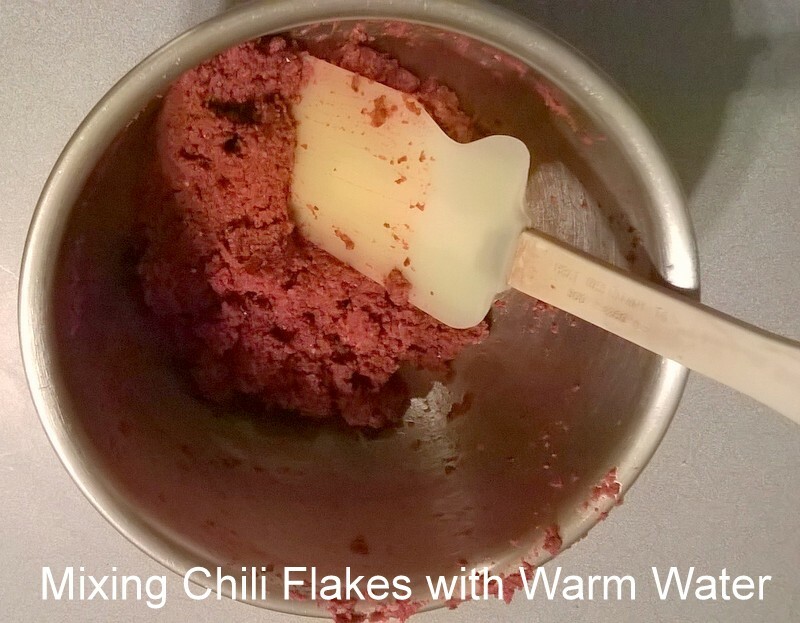 Add warm water to chili flakes and make into a paste. 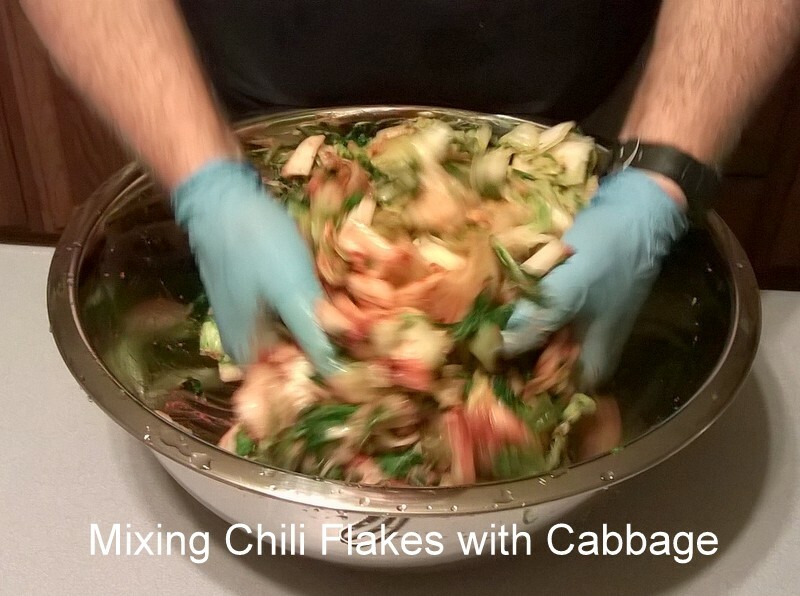 I strongly recommend you wear latex or nitrile gloves prior to mixing chili paste with the cabbage. Otherwise, your hands will become glowing hot!! 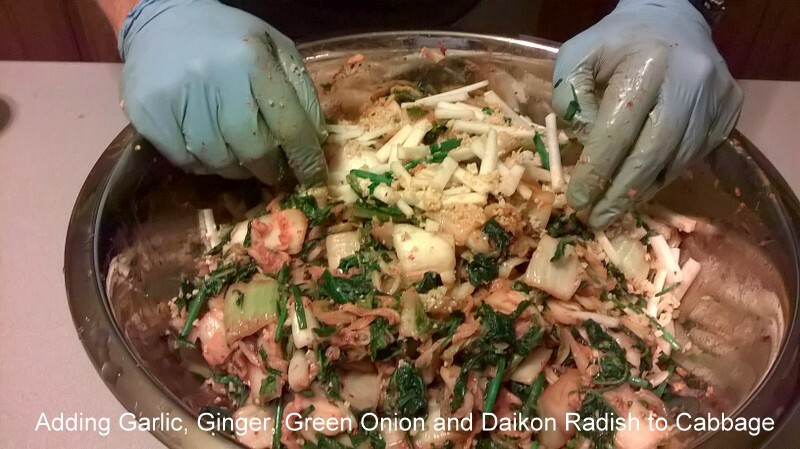 Mix the chili paste with the cabbage, green onion, garlic, fresh ginger and Daikon radish. Mix thoroughly!! 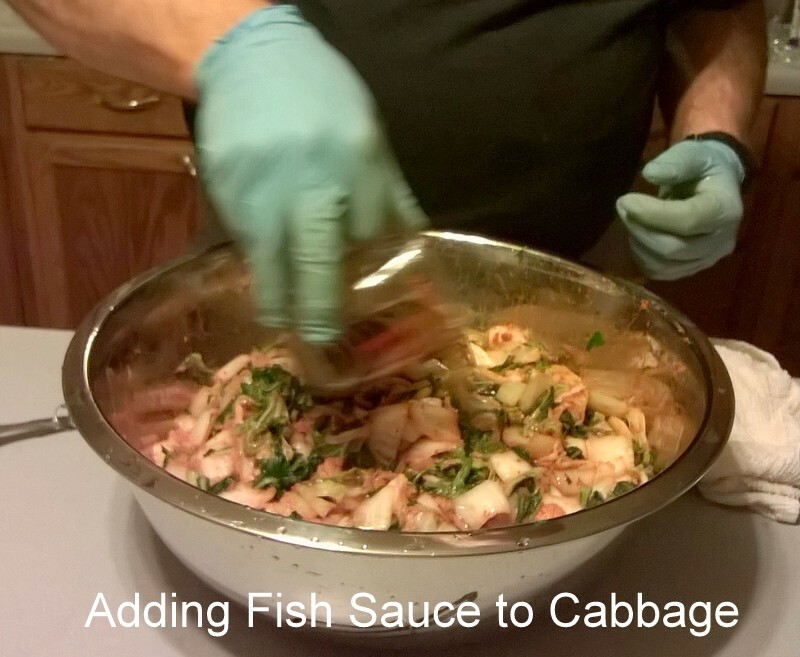 Add fish sauce, shrimp paste and sugar to the cabbage mixture. 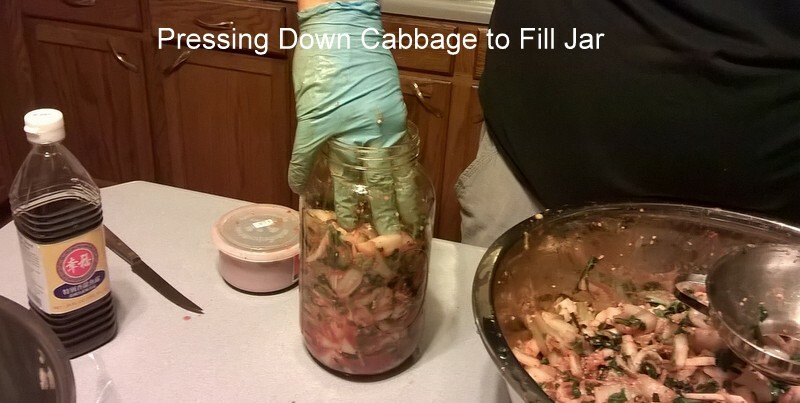 Place cabbage mixture into sterilized glass jars, packing tightly, leaving a 2″ head space. Let rest for 24 hours at room temperature. Refrigerate up to 30 days. Enjoy with rice, in soup, stir fry or as a side dish.